We live in a very visual culture. Your pupils are used to being visually stimulated from so many angles and from such a young age with all the technology that is available to them. In order to engage them, we are in a time where the visual presentation of lessons, activities and your school are of huge consequence to a pupil’s ability to learn. Stimulating learning environments both in the classroom and around the school contribute greatly to enthusiasm, engagement and attitudes towards learning. 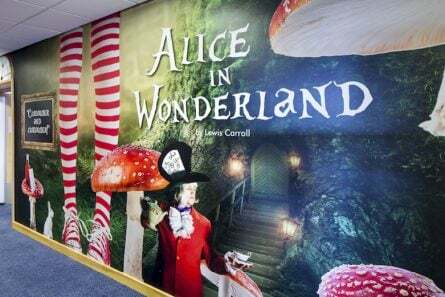 Colourful, imaginative and appealing displays are not only a way to lift mood and make the learning environment a brighter, happier place to be, they also contribute significantly to children’s subconscious learning. Attractive and inspiring surroundings contribute to a positive outlook towards life and learning. Internal classroom displays of children’s work are vital in celebrating and valuing their efforts. Adorning a classroom with children’s contributions gives them a sense of purpose and value to their work, thus increasing motivation and self-esteem. Displays that encourage questioning and interaction can support engagement with topics being taught and provide vital cues in lessons to assist in children’s learning, however, children’s efforts and a range of resources alone on your school’s walls will not raise their enthusiasm and aspiration as much as combining these with inspirational wall graphics. 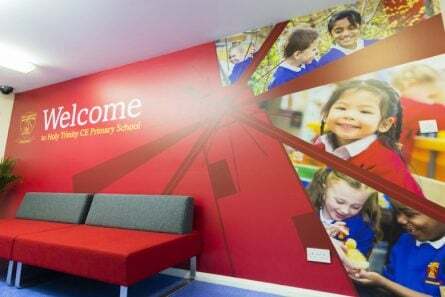 As schools you can be celebrating pupil’s current achievements through classroom displays of their work whilst also showing them what they could achieve in their futures through bespoke wall graphics. Roebuck Primary School and Nursery wanted graphics that would inspire children’s future pathways whether they were interested in the performing arts, science or sport. Graphics such as these make obvious and exciting the careers choices a pupil might follow in life thus giving a sense of purpose to their efforts and help them to set goals, which they then aspire to achieve. Schools are increasingly using walls outside of the classroom as much as inside them to motivate and engage. Graphics that depict an era in history or key scientific achievements, such as a timeline, can arouse curiosity and consolidate and extend pupil’s learning. Shooters Hill Campus wanted to celebrate their history as a college alongside significant moments in British History to promote British Values which they did through a historical timeline. Graphics that show the achievements of the greats in a subject can give opportunities for observations and encourage much wanted critical thinking. 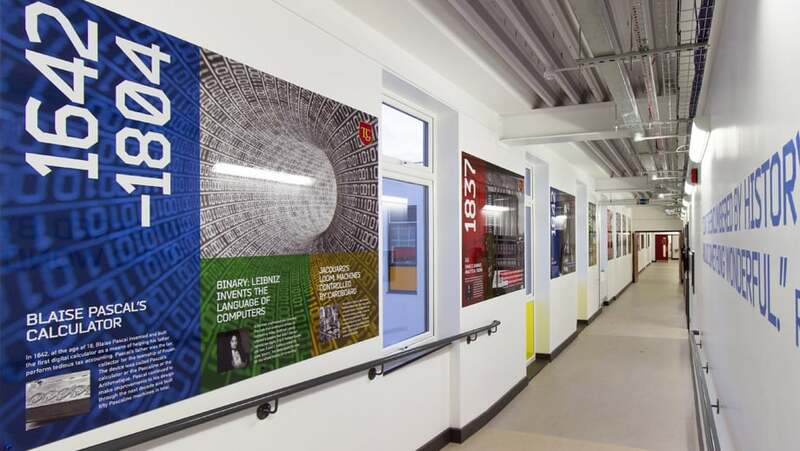 Townley Grammar School wanted graphics that would document the history of computing with key moments in computer development, including the lives of pioneers such as Ada Lovelace whom their new computing suite is named after. The main aim of displays has historically been to celebrate and aid pupil’s learning and this is still an important factor in what a school does with its walls. 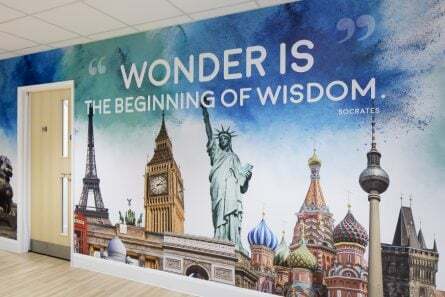 Here at Promote Your School we are ready and excited to help you bring your school’s walls to life and get the most you can from every spare bit of wall you have to support your pupil’s learning journey.